“The reason we had this college hour was because it was timely information for the community,” said English professor Amanda Corcoran. The presentation went over the types of wildfires, how fire fighters fight wildland fires, and how to survive a wildfire. “80 percent of wildfires don’t get headlines,” said Lannone. Most of the fires can be contained by hand crews, firefighters hike into the burn areas and use pic’s, shovels, blowers, and sometimes plant repellant to fight these fires. “Hand crews account for 80 percent of the fighting force,” said Lannone. Hand crews must endure different conditions and terrains while fighting fires, the tactics they employ must also be just as different. One of the tactics is “fire breaks” or “fire lines” which are long and wide stretches of dirt tracks that have been cleared of any brush or fallen trees keeping the fire from being able to continue burning. “I didn’t know you could dig around a fire to keep it from burning,” said ARC student Sherry Johnson about the use of fire lines. Another tactic firefighters use is backburning, this process uses smaller fires against the main fire, when the main fire gets to the area the fuel has already been burned so the main fire no longer has a place to spread. If a person is caught in the middle of a wildfire in a car and are able to drive out they should roll up the windows, close the car’s air vents, and turn on the headlights. If a person is unable to drive out, they should pull over and turn off the ignition but leave the headlights on, find a jacket or blanket preferably leather or wool and hide below the level of their windows and wait until the main fire burns through. If hiking and a fire breaks out try to move around the fire by going upwind and downhill, try to stay on dirt trails and rocks and make sure that clothes stay dry and to stay out of canyons or passes. If a person is caught at home they should close all windows, call 911, and make sure to have a fire plan. 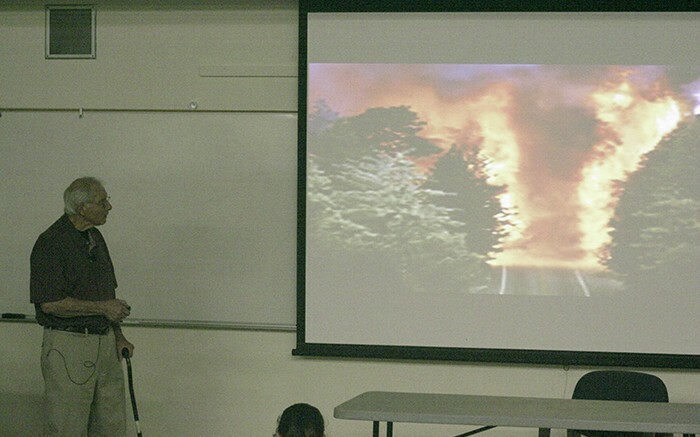 Be the first to comment on "College hour discusses how to be prepared for wildfires"